I made this recipe for BreadBakingDay #5. Chelsea from Rolling in dough, the host of BBD #5, has chosen filled breads as theme. Left to Right:cream cheese fatayer,mini pizza,Feta Cheese +spinach ftayer. 1 recipe 10 Minutes Dough. low fat halloumi or mozzarella cheese, shredded. 2 small onions, finely chopped. 500-600 g spinach, Fresh or frozen. 1 teaspoon Arabic Gulf mix spice. 1) Heat oil in pan add onion, cook, stirring until is soft. Than add spices, and spinach, stirring than add lemon juice, cook about 5 minutes (cool to use for filling). 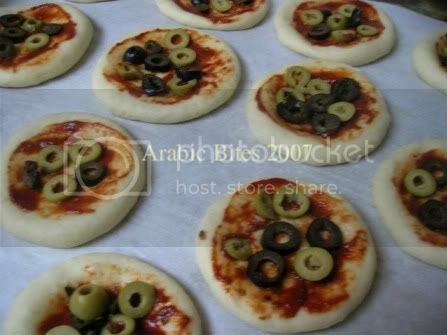 2) Divide dough into 36 pieces. Roll each to a 9 cm round. 3) Fill each with 1-2Tablespoons of any filling above. 4) Place Fatayer onto oven trays. 5) Bake at 375 F about 15 minutes or until browned. 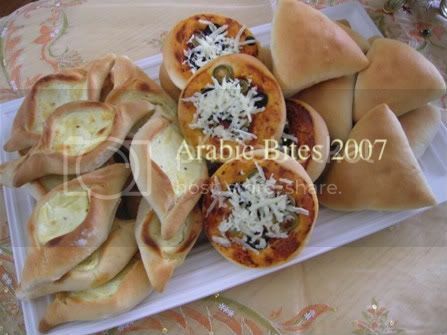 I love any food made with feta cheese,I hope you get a chance to try this fatayer. Glad to hear that you are enjoying the blog. Those with feta cheese filling look absolutely fabulous!!! Try make them and don't for get to tell me what you think. I think the recipe you looking for is safiha.just replace lentils with meat,top it with pine nuts and shape it as you like. Thanks for the great pita and naan recipes. 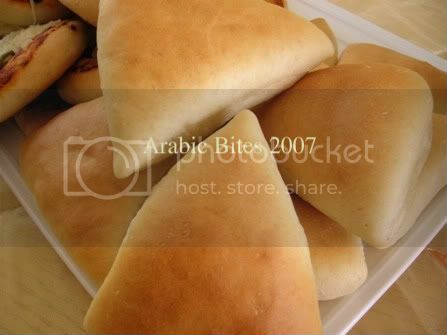 I had tried pita bread a few times but it was always hard as a rock. Now I see why, the recipes called for 10 minutes at 450F. Two minutes at 550F makes the difference (that and the better recipe too, of course). The only problem I had was that I needed two helpers to fan the smoky air away from the smoke alarms! Glad to hear that the two recipes works well for you. you right 2 minutes makes the difference because 10 minutes is to much time for bake flat bread. Wow, they look super and even more you use my two favourite cheese: I live in Greece and I come from Cyprus so feta and halloumi are our national cheese, respectively. So it is definitely on my to do list. Thanks for Bread Baking Day No. 5 giving us the opportunity to share our recipes and thank you for posting it. Your breads always are so stunning! Thank you so much,if you give it a try don't forget to tell me what you think. Thank you for create breadbakingday event. first time to your blog, and it's wonderful! Love the mini pizzas! welcome to the blog,& thank you for the nice comment. welcome arundati,thank you for the comment,you so sweet. i just cant tell how happy iam to find your blog! !wonderful pictures n recipies!! 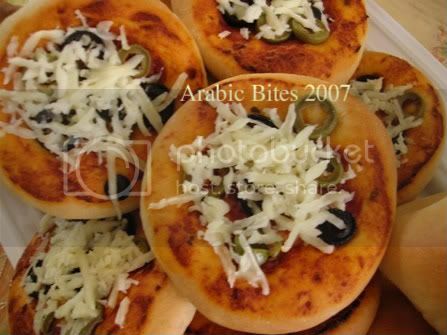 !REALLY AMAZING ma sis..i was in uae for 20 yrs born n brought up there...as im back to ma country ,i missed all my fav arabic foods..plz post more recipies..LOVE UR BLOG..BEST BLOG!!!!!!!!!! !THUMBS UP. Thank you for this recipe! It worked out really well and I love the step-by-step instructions with pictures. I tried a similar fatayer recipe recently and did not turn out as good. Definitely feel encouraged to try other recipes from this site. What gorgeous pastries! They look so scrumptious! That weird ,10 minutes dough even work with 100% whole wheat & still soft. Maybe you make it too thin,try next time to make it a bit thicker. waaw,, i like it . . . I had tried pita bread a few times but it was always hard as a rock. Now I see why, the recipes called for 10 minutes at 450F. Two minutes at 550F makes the difference (that and the better recipe too, of course). 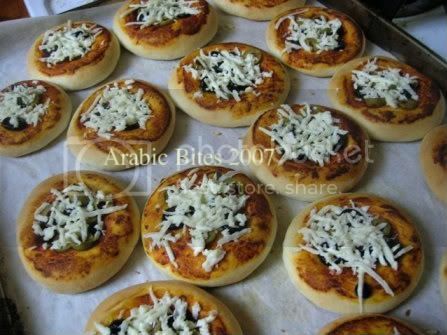 Hi Zainab!I just moved to the USA from australia where there were so many Lebanese bakeries. I absolutely loved the "haloumi cheese pie" from one bakery. I think that's the Fatayer right? It looks just like the triangular bread. How did you fold/shape it after filling it? The filling of the cheese pie i had was like the texture of mozzarella cheese, do you think they used that with the haloumi, since haloumi doesn't melt? See my post here to get an idea of how I shape my Fatayer. for the "haloumi cheese Fatayer" I use two kind of cheese , it's true haloumi cheese doesn't melt but it lose some of the water in it & become so dry so you have to combine another kind of melting cheese like "kashkawane" or "nabilsy" if you can't fine any of those you can use mozzarella cheese. Thanks for your response Zainab! I traveled around and found halloumi and kashkaval cheese. I'm so excited to try the Fatayar (feta cheese and spinach one in the pictures, but with halloumi and kashkaval filling). I saw the post you gave the link to, but i was referring the triangular bread, the one with feta and spinach filling. How did you fold that one? 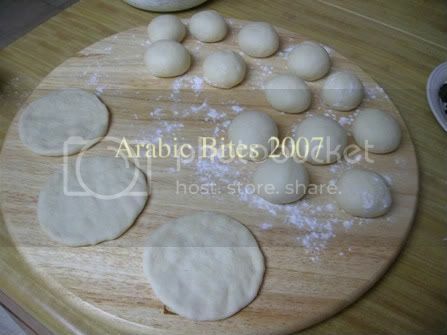 after dividing your dough to small balls,flatten by your hand to form round shape, then pinch 2 ends first and then the third to form a pyramid.